My grandparents sailed on the SS Athenia, Glasgow to Montreal around 1935. We have a glass, shaped like a thistle engraved T.S.S. Athenia and underneath A Wee Deoch-an-Dorus. Can you tell us anything about this glass? 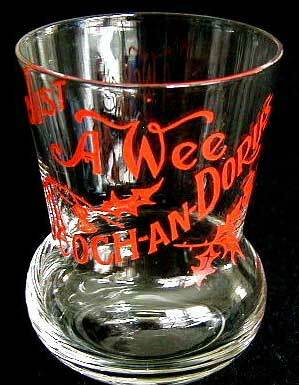 I could not find a Thistle D and D glass from Athenia, but here is one with the expression on it.